If there is anything I can offer to the fitness world it is my relentless quest for flavor in food and a desire to make food more appealing to people who are trying to get fit. I use the international kitchen for inspiration, meaning I combine spices, herbs, ingredients and recipes from all over the world and tweak them to fit my dietary needs so I can have my tummy and soul satisfied. Having traveled to and lived in multiple countries, I’ve adapted many culinary tricks I’ve learned along the way and put my own spin on it. I am not a fan of jumping on the latest bandwagon of the latest and the greatest- for the longest time I resisted using any kale, quinoa or gluten free recipes, because I got bored of seeing everyone thinking this was the solution to all their health problems, and mostly I want the food to be organic (meaning natural- from nature!) and also important; serve a PURPOSE – for my goals. Some parts of the year I will be in contest prep meaning most of the stuff I post on my Facebook page I will not eat (sad but true) – but most of the time I am all about using fresh, seasonal ingredients combined with wholesome ingredients that transport me to a certain place. Food for me is fun, food is emotion, good times and pleasant experiences – even as a fitness competitor I refuse to let those pleasures escape me. Your diet does not have to be torture – quite the opposite, it can be delicious satisfying and rewarding while low in fat and high in nutrients. Today I decided to make a pot of chicken to last me for a couple of days – because I am in a period where I am tiring of cooking. 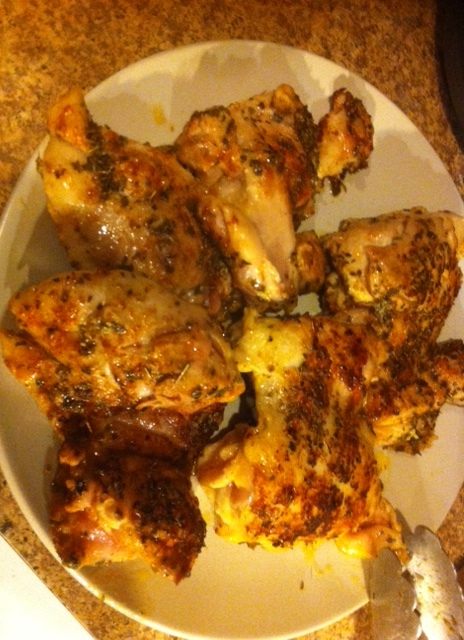 Season the chicken thighs with salt, taco seasoning and oregano. In a large Dutch oven, heat the oil on medium-high heat – place the chicken thighs in the pot (be careful not to overcrowd the pan – they need to be in a single layer, otherwise they will steam), sauteing the chicken thighs about 3 -4 minutes on each side until golden brown. Remove chicken thighs onto a plate and set aside. 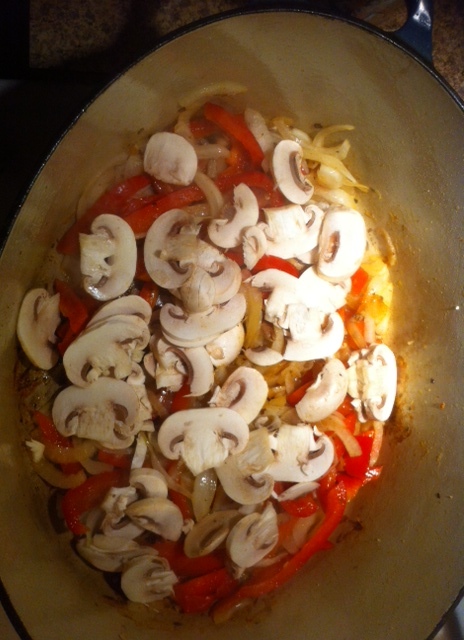 Add onion, paprika and mushrooms, season with salt and pepper and saute until translucent/soft, about 10 minutes. 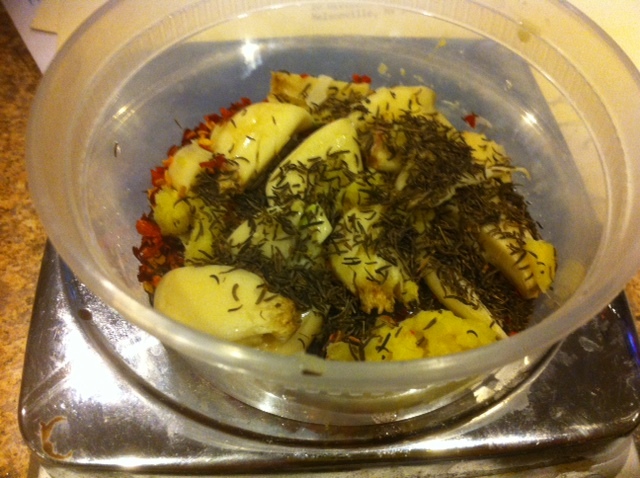 Add the garlic, ginger, cumin seeds and chili flakes and saute for a couple of minutes. 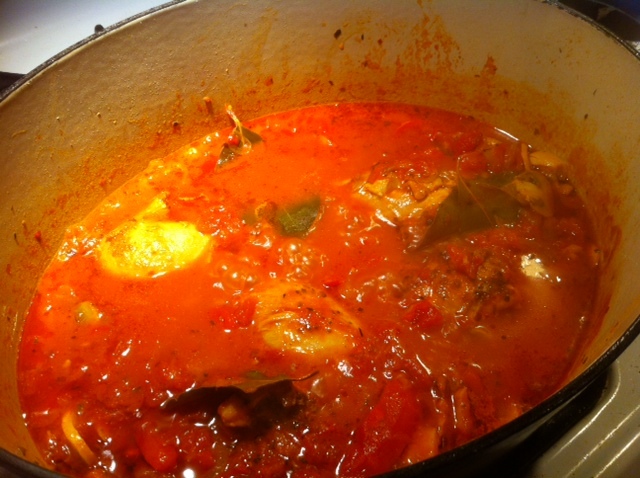 Add in the tomatoes, cinnamon sticks and bay leaves and simmer for about 5 minutes until flavors blend. 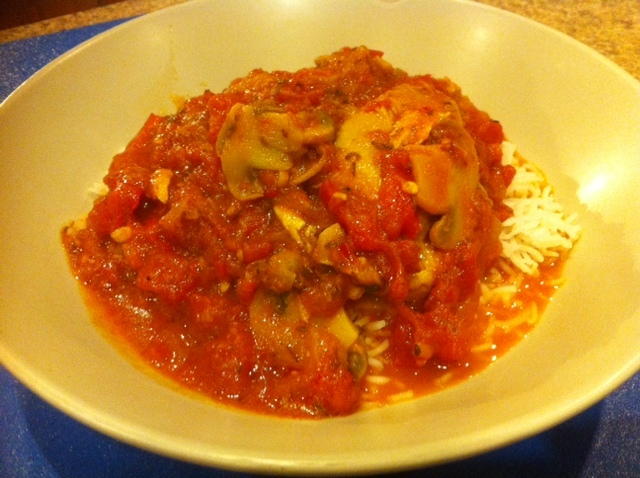 Add in the chicken thighs, reduce heat to low, place a lid on the pot and simmer for 45 minutes to 1 hour. Serve with white rice or as is. Delicious! As always, great blogs! These dishes look amazing! Thanks for each and every one of your blogs and facebook entries; thanks for the seriousness and the laughs; love it!! I am hanging in there – thank you so much for asking, Sunny! On top of everything else, for the last month, my lower back (SI joint) keeps popping out. It has been quite a year…..I have been working out since I was 13-14 years old (going to be 48 this year) and never, ever went so long without without working out or working (one year and one month so far)……”#*%^@!” ugh! Anyway, I am glad the weather has been warm and sunny lately. I appreciate your blogs and facebook more than you will ever know! Do some sets and reps for me Sunny! Aww sorry to hear of all your troubles, Sally – hope you improve fast and can get back to training soon! Thanks as always for your wonderful comments and support!